How will AI help or hinder entrepreneurship? 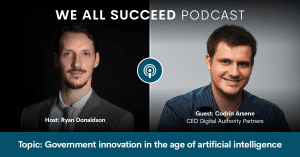 DAP’s CEO, Codrin Arsene, talks with Enterprise Radio’s Eric Dye about the exciting possibilities of using AI in entrepreneurial endeavors while discussing some of the challenges entrepreneurs may encounter. Michaels: Can you start by giving a quick overview of what artificial intelligence (AI) is, how it is used and why we should care about it? Arsene: To understand AI we need to start with a baseline, and that baseline is human intelligence. Humans are able to take input from various external sources via different channels — we see, we smell, we hear things — and then based on all of this information that we absorb, we make decisions about systems, about people, so that the ability to process information both structured and unstructured, is ultimately the core function of intelligence. Artificial intelligence is nothing more than the advancement of technology that would allow computers and technologies and algorithms to do the same thing. Artificial intelligence right now is not advanced enough to surpass human intelligence. That said, many people believe that superior intelligence can actually be created and ultimately super intelligence is the idea that AI can progress to the point where machines can become smarter than a human. As humans, it doesn’t matter how smart we are, if you get to the point where you’re too tired, you’re going to make mistakes, if you’re burned out, you’re going to make mistakes. So the reason why AI is so exciting for many people is that you remove that human element. If we can achieve this so that artificial intelligence can complete specific tasks as well as humans but do it around the clock, then that, of course, is reducing errors, you’re making decisions faster, and ultimately make better overall decisions because that’s what artificial intelligence is and that’s what a lot of scientists are working on achieving. Michaels: Can you discuss some of the most innovative examples of AI in the past few years? Arsene: There are so many examples that we can talk about. Tesla, for example, has been known for many years to use robots in the assembly line. They’re not incredibly sophisticated but they’re very good at achieving specific tasks and completing them on time, working around the clock. Another famous example is Sophia from Hanson Robotics in Hong Kong. She can process information and she can interact with human beings. There are things that she can say that makes total sense contextually to the person she is talking to, and some of those things are actually very funny remarks. As a matter fact she is the closest thing to the idea of a superintelligence even if she’s not smart enough yet. The more mundane AI that we all know are tied to smart devices and smart systems; Alexa, is a big example of a chatbot that captures human information and then based on a series of libraries and rules that are in place, returns some answer to questions that humans. Siri is another system that we’ve been using for so long that we don’t even think of it as artificial intelligence. AI that is improving our lives on a daily basis. For example, one of the most mundane examples is Netflix. The more shows or movies you watch, the more their AI can predict what it is that you want to watch. All of these examples are not fictitious or what the future can look like, these are real examples of artificial intelligence that is being used on a daily basis in today’s world. Michaels: What are some of the industries that will be most impacted by AI over the next decade? Arsene: The industries that have the biggest potential to be impacted are the ones that require a huge amount of human interaction. The healthcare industry comes to mind. AI can be leveraged in the healthcare space day in and day out, whether it be to capture vital information about specific patients, to help doctors in the operating room, so on and so forth. Artificial intelligence in healthcare is nothing more than an aid for doctors and practitioners and as a result of that, it will have the least amount of resistance when it comes to implementation despite having a lot of regulations that need to actually allow for the solutions to be deployed. Another one that I’m really excited to see the impact of artificial intelligence is the financial technology industry. Everything that has to do with how we manage money, how we track it, how we receive it, and our projections for if we can afford a mortgage, if we can afford a new loan, can all be supported by AI. The entire interaction between humans and banks is very interesting because at the end of the day, everything that happens in that human to human interaction to manage our lives financially, about 95% of it, can be automated. So I’m really excited to see how AI influences Fintech and healthcare. Michaels: What should entrepreneurs know about AI? Arsene: Artificial intelligence is as much of a technology as it is a framework. Entrepreneurs should think about the ideas that they come up with and also think about how they can actually leverage artificial intelligence to increase the speed and accuracy of whatever platforms they are working on. The beauty of artificial intelligence is it can automate the small or tedious tasks. My advice is to always take into account how artificial intelligence can make whatever product you are defining better, faster, more accurate. Ultimately if you do that you’ll be able to really tap into the potential for artificial intelligence. It is not only a technology, it’s a business solution as well. 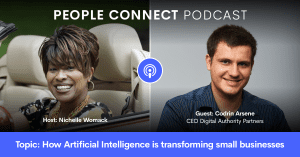 Michaels: How should entrepreneurs leverage AI in their initiatives? Arsene: When you’re building a business there are specific things that need to happen. For example, if you are a retailer and you have logistics, or you have B2B work, whatever type of business you have as an entrepreneur, you’re always looking for feedback. Regardless of the business you’re in, you’re always going to have questions from your users. Customer support is foundationally just a back-and-forth between a company and individuals around a specific amount of use cases that your business will have and that’s where artificial intelligence can come in very helpfully. Many businesses all over the world are deploying AI solutions. When you’re thinking, how am I going to interact with my customers, the first question should be can I apply a very simple AI solution and the answer for customer support is yes. Data collection and feedback is really important and most of it can be fully automated. Right now you can use Google APIs that are in place, called the Google natural processing API, that will basically collect information about your business all around the Internet and social media and see what it is that people say about your business. Logistics, customer support, and collecting data information, all of these are existing AI solutions that every entrepreneur should at least consider implementing. Michaels: Can you speak about some of the ways your company’s currently leveraging AI? What are the use cases? Is AI living up to the promise in your experience? Arsene: DAP works both with third-party clients that are in the process of implementing artificial intelligence solutions and is also developing various AI solutions internally. I would say across-the-board, all of the AI solutions that we have worked on have been very successful. This is because they were developed first for a very specific use case. This is something entrepreneurs and executives all over the world need to bear in mind. AI is only as smart as the people that are defining different business roles behind the AI intelligence and is only as smart as the information being collected about how your AI is being leveraged. Then making customizations and optimizations over time as a result of the interactions between the AI and specific customers. When it comes down to some of the projects we are working on, we are pretty close to launch for one of our clients, an HR solution company called Hiresphere. Hiresphere is a solution in the recruitment space that can look at any number of resumes and digital profiles, like social media profiles for any potential candidate all over the world. It shows out of 100 different profiles and resumes, which are the top three that you should be interviewing. The latest task that we ran was looking at 150 resumes. The top three choices that the machine learning algorithm that we built came up with were identical to the ones that actual recruiters selected, but it did so in a fraction of the time. Internally, we are working on a variety of AI solutions and products. We are a product development and consulting company in Chicago. One of the things that we do all the time when clients come to us, is to look at their website and mobile apps and see why they are not performing well. One thing that we realized is that when most of our clients come to us with non-performing digital products, holistically they have similar issues. We started building an AI algorithm and solution, which ironically, is going to take us out of business. 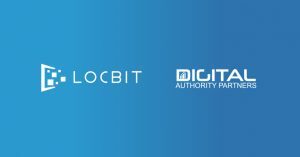 It’s a solution that will ultimately replace our own agency by being able to automatically look at a website or mobile application, and quickly and efficiently say, from a user experience point of view, what are all the things that are wrong with these solutions in order to optimize it. It’s not going be perfect with regards to the business side, but we’ve already seen significant progress on the path to basically replace our own business with this automated solution. 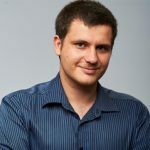 For more, head on over to the full interview here, or check out Codrin’s other interview and write up about AI and Healthcare.